PlayStation VR has a lot going for it – it’s the highest selling virtual reality headset, it has a solid library of games, it’s very accessible – but its controllers let it down a little. After all, the PlayStation Move controllers were originally released for the PS3 to act as competitors to the Nintendo WiiMote and were never originally intended for the kind of super-precise tracking required by VR controllers. As a result they feel very inaccurate, especially when compared to the controllers from competitors Oculus and HTC Vive. Now that the headset has been on the market for more than a year and its controllers have been available for even longer, the time seems right for an update. And a new patent from Sony suggests that may be in the works. 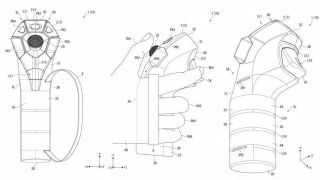 Filed by Sony Interactive Entertainment in Japan in July 2016 and published in early January, the patent features a new controller design which looks very much like it’s intended to be used with the PlayStation VR. While the PlayStation VR’s current controllers are more of a wand design, the controllers in this patent appear to be more reminiscent of a flight stick, with a trigger at the top rear and an analog stick at the top center. This is a redesign that really takes into account the way many players play VR games and the limitations imposed on them by the current Move controllers. For many PSVR games, players actually end up using their DualShock 4 controller for smooth movement in-game, which limits any potential for motion controls. A new controllers which can incorporate both could see control systems in PlayStation’s VR games become even more immersive. In addition to the analog stick and rear trigger, the controller patent also states there are buttons surrounding the analog stick, a light sensor, a microphone and “a hole for outputting sound”. On the rear of the controller in the patent, there appear to be optical sensors “for detecting the position of” the middle, ring and little fingers of the user, suggesting Sony is considering some form of hand tracking. This kind of feature could be incredibly interesting in terms of giving a sense of movement or scale to items users are holding in-game. Imagine, for example, being able to feel the difference in size between different virtual objects (read: probably guns). Or picking up a moving object and feeling the controller squirm beneath your palm. It has a lot of potential. Of course, as this is a product in a patent, there’s no guarantee that we’ll ever actually see it released. However, it does make sense that Sony is considering a controller redesign now that it has a better sense of what players need from the games they’re playing on the platform.